According to Medicare and Medicaid Services, 2/3 of emergency room trips for nursing home patients are avoidable, but nursing homes cannot take the risk of not calling 911. So, that’s where Call9 comes in. This tech-enabled healthcare service delivers immediate care to patients’ bedsides with its 24/7 on-demand access to emergency medicine physicians. In order to make this platform effective, patients are visited initially by a Call9 responder, equipped with a suite of diagnostics, who works with a physician remotely to administer coordinated care. AlleyWatch spoke with CEO and founder Tim Peck about what it means to launch a telemedicine startup that is pioneering nursing home care. Tell us about the product or service that Call9 offers. 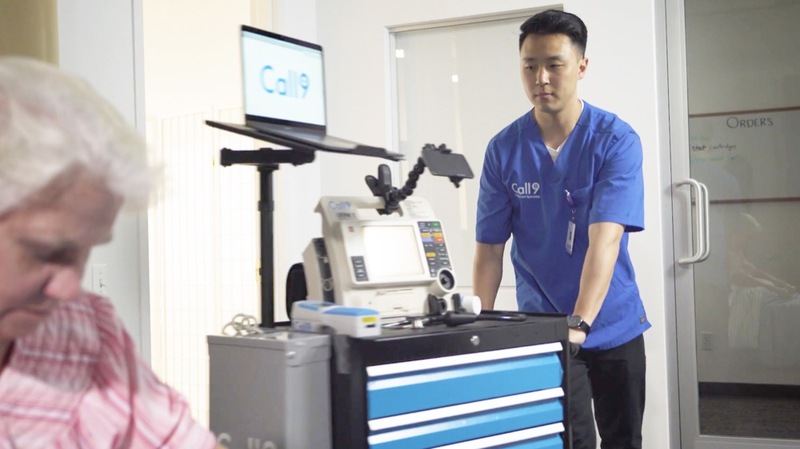 Call9 is a technology-enabled healthcare service that delivers immediate care to patients in skilled nursing facilities in the comfort of their own beds. Founded by an emergency medicine physician, Call9 has created an innovative, human-powered solution that reduces unnecessary Emergency Department visits, hospitalizations and subsequent readmissions in nearly 80% of patient encounters. 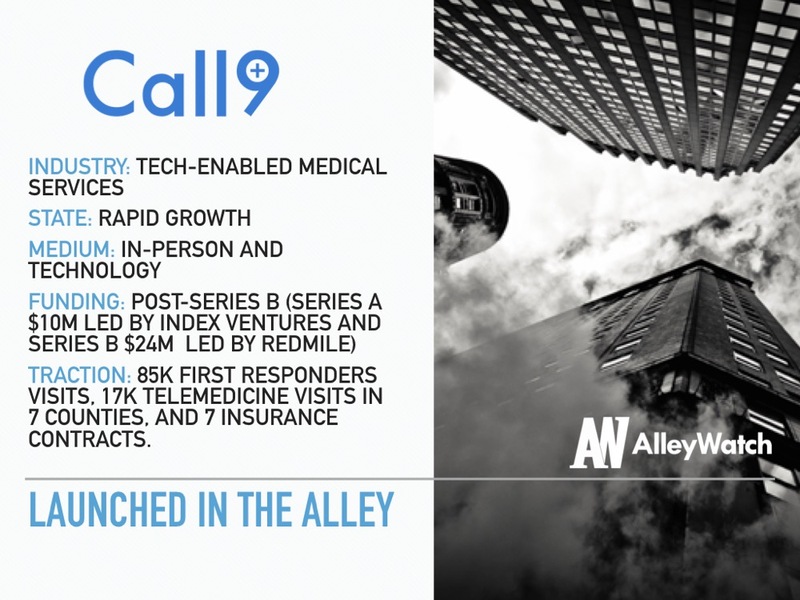 Call9 is a pioneer in the field of nursing home care, offering 24/7 on-demand access to Emergency Medicine physicians who have access to diagnostics, real-time vitals of patients, and full-integrations with a facility’s electronic medical records. When a patient has an acute event, the nursing home nurse activates our service, and a Call9 emergency-trained first responder goes to the patient’s bedside with a suite of diagnostics — including telemetry, EKG, real-time ultrasound, bedside labs that result in two minutes or less, etc. — and immediately connects to a remote Call9 emergency medicine physician, who can see, diagnose, and treat the patient via the hands of the first responder. What market does Call9 target and how big is it? Nursing homes and insurance payers that pay into nursing homes. There are 15.6K nursing homes in the United States, 1.3M emergency room trips for nursing home patients, and Centers for Medicare and Medicaid Services says 2/3 of those trips are avoidable, representing a $40B unnecessary healthcare spend by insurances, including Medicare. Why the focus on the nursing home segment? There are more than double the amount of nursing home beds in this country than hospital beds. Yet, so many more resources are poured into hospital care than nursing home care. We believe that by focusing on this population, in this setting, we can deliver far more value to the patient and the healthcare system than would otherwise be the case. 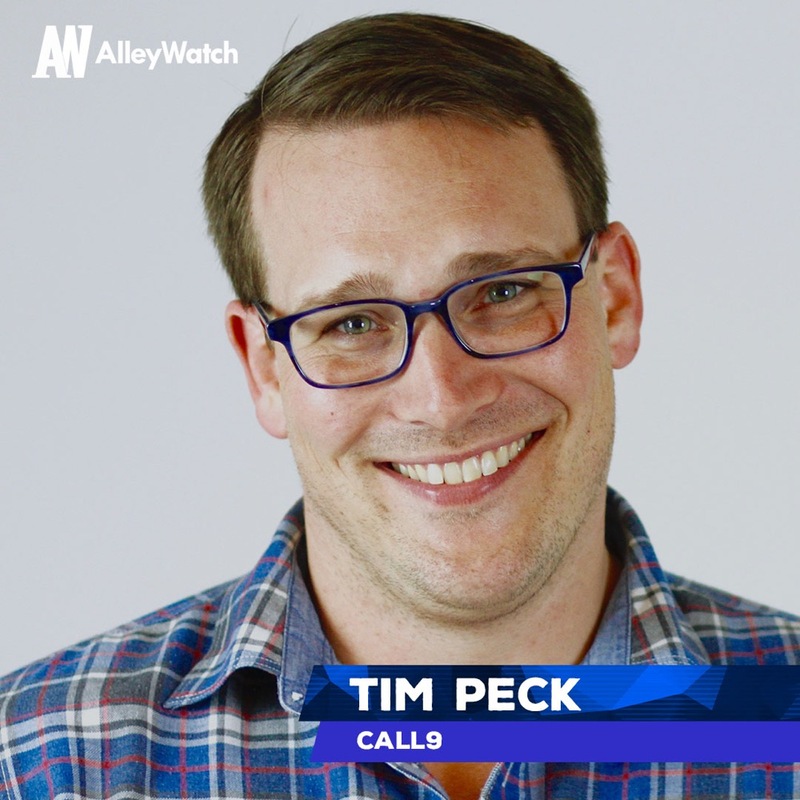 What is the business model for Call9? Call9 charges a platform fee to the nursing home — for our ability to care for their residents in their facility, for allowing them to accept higher acuity patients, and for delivering a superior experience both for the patients and their loved ones. 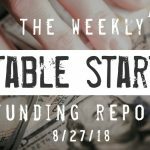 Nursing homes are also paying for access to tremendous LLP valuable data that we have, which allows them to increase quality for their patients. Additionally, we contract with insurance payers for treating the patients of theirs that we care for. What inspired the start of Call9? The founding principle of Call9 is, “Do right by the patient and all else will fall into place,” — it says that on our front door. When Call9 was founded it was to be with patients at their most vulnerable time, the moment of their emergency. 19% of all emergency transports to the hospital come from nursing homes, and nursing home patients are among our country’s most vulnerable patients. Caring for this population at their most challenging times inspired, and continues to inspire, Call9. Add between one and two facilities each month. Care for more than 5K patients. Continue to avoid hospitalization in nearly 80% of the patient encounters we have. Continue to contact the patients’ loved ones whenever they have an acute event. Move into next market/s and prepare for hypergrowth. Mayor Bloomberg. He’s an innovator, a philanthropist, and someone who’s really moved the needle in improving healthcare for millions of people. Plus my Chief of Staff is a Johns Hopkins grad and would love to share his appreciation for a fellow alum. 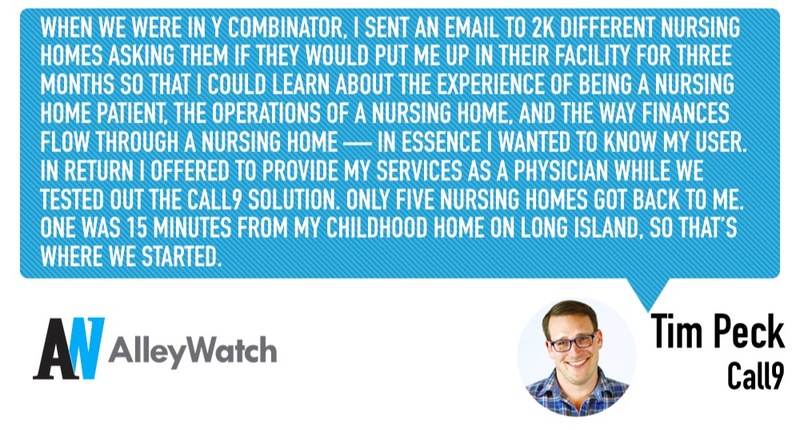 When we were in Y Combinator, I sent an email to 2K different nursing homes asking them if they would put me up in their facility for three months so that I could learn about the experience of being a nursing home patient, the operations of a nursing home, and the way finances flow through a nursing home — in essence I wanted to know my user. In return I offered to provide my services as a physician while we tested out the Call9 solution. Only five nursing homes got back to me. One was 15 minutes from my childhood home on Long Island, so that’s where we started. As we grew and new nursing homes, insurance payers and the Department of Health embraced what we were doing, it only made sense to move our engineers and support staff from Silicon Valley as well. The Startup New York program has also been a great draw for us. Peter Luger. Once, Now, Forever.